Hi! I'm Yui from ThreeBox, a company that promotes Japanese culture, trends, and quality products globally. We currently focus on sake, a drink that is still relatively undiscovered, but has a growing number of fans across the world. 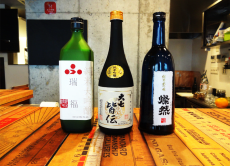 Let's learn the wonders of sake and become a fan of the drink!